You know it has been a busy week (month, fall, year) when it takes 3 days to blog the latest Bryan Mathers magic for Reclaim Hosting, but such is life as a successful businessman. In fact, I’m putting the cart before the horse here a bit by blogging about the art for our next Roadshow (which will be at Michigan State University in late February, but more on that in my next post) before officially announcing the event, but such is life in the fast lane of corporate edtech. 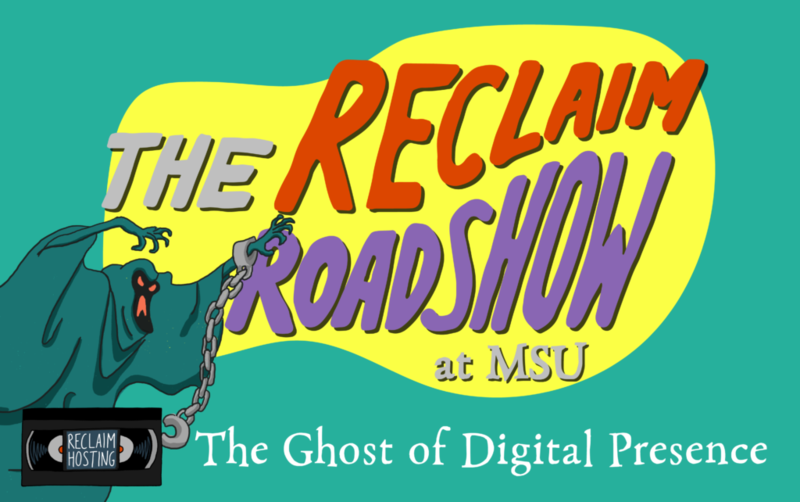 Anyway, following on the fun we had at Skidmore College with our first Roadshow we doubled-down with Michigan State for what will be our second Roadshow, and while we were consolidating some of the details it occurred to me we really need some art for these events. For me it is always aesthetic first, truth and details later. So, two weeks ago Lauren and I reached out to Bryan and he was kind enough to turn around a meeting within a few days and we had our discussion. We laid out what the Roadshow was all about, essentially it’s a way for Reclaim to hit the road and bring together folks in specific regions of the US (and soon beyond?!) to provide targeted training to folks who could not make it to our workshop. What’s more, we built in a second day to bring together current Domain of One’s Own schools in the region to share the work they’re doing. And, as we quickly learned at Skidmore, it also provides a unique opportunity for those schools who are interested in exploring Domains to get an on-the-ground look at how it is being used. So, we gave Bryan the overview and the discussion got underway and what seems like almost immediately we stumbled on what might be the best Reclaim Hosting marketing campaign to date (I’m little more than a crass marketer after all, but with a heart of gold—unlike all those other thought leaders!). We started talking about road tripping for Reclaim and I could not help but think of the bus…which made me think of the brilliant grant proposal (at the goading of Brian Lamb) we submitted under the aegis of ds106 to the Gates Foundation back in the day to fund a ds106 bus. They couldn’t see the magic, surprisingly, but luckily if you will it, it is no dream…at least on paper. The bus has been re-animated as a Reclaim Roadshow Mystery Van a la Scooby Doo, and it is so damned beautiful I wanna cry! 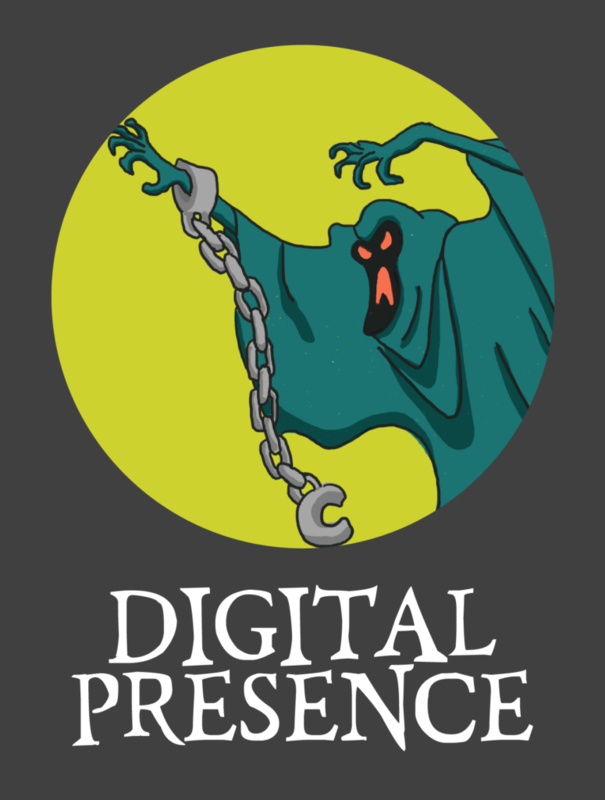 I’ll talk more about the details around the Ghost of Digital Presence title in my next post, but you get a sense how each Roadshow can be its own episode with various “Monsters of EdTech” (borrowing from the now canonical Audrey Watters after the other day’s “I’m f**king done” announcement—punk rock) as topical villains to animate discussion. In fact, it only makes sense this will all be produced by Reclaim Video. The last discussion I had with Bryan was thinking through what an animated episode of an actual Reclaim Roadshow would look like—maybe Audrey would “ghost write” an episode? So, in order to kickstart some ideas I ordered the first two seasons (1969 and 1970) of Scooby Doo on DVD for holiday watching with the kids, and one of my resolutions for 2019 will be to see if we can create a Saturday Morning Animation series of Edtech. This also touches on another video project I have been wanting to teach, and even wrote an unnecessarily long email to Martin Weller about my ideas around video and teaching, but I should probably save that discussion for another post given this is already running long. If nothing else, let this post attest to the fact that Bryan Mathers is an endless fount of creative awesome! This entry was posted in reclaim, Reclaim Roadshow, ReclaimVideo and tagged art, Bryan Mathers, MSU, reclaim, reclaim roadshow, Roadshow. Bookmark the permalink. This idea has some legs. You could Reclaim the GI Joe PSA too. That’s just righteously brilliant. Well, at least for those of us who were nurtured by tv cartoons. And also, a very clever way to make sure a big shaggy dog goes on the road with you. 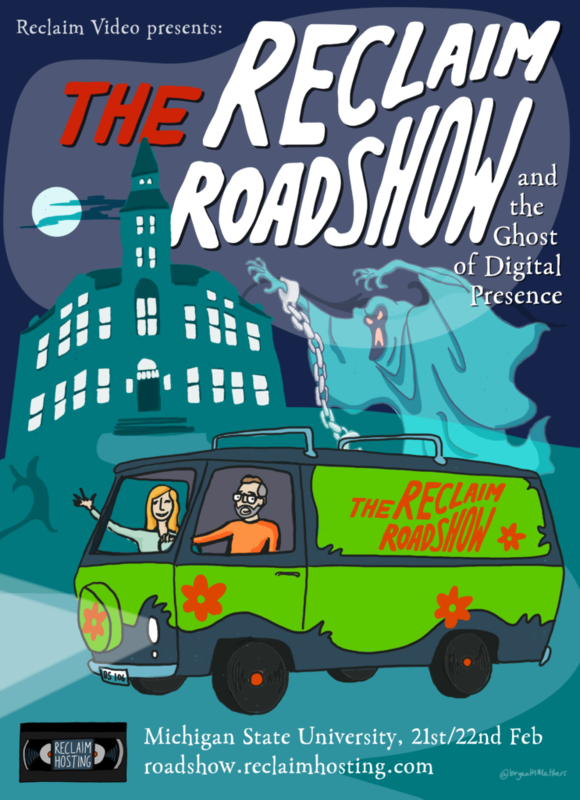 I like the approach of a roadshow in the spirit of Scooby and friends — all energy and good will, not over-planned, and ready to engage with whoever shows up to “right the wrongs” (in this case, digital ones). Appealing to us from cartoon-era days, but probably also to millenials and those who follow them — all of whom seem to avoid structure and rigidity which this approach just simply doesn’t have. I would at some point like to see a list of the possible topics and solutions and services/offerings that will be discussed at MSU. Won’t hold you to them, but at least gives us a sense of whether it’s worth making the trek from the west coast.